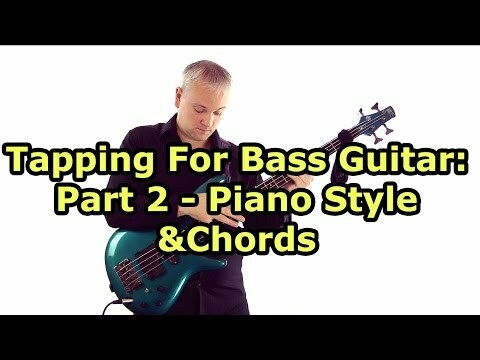 This is the second lesson in a short 3 part series dedicated to Tapping for Bass Guitar. The series is broken into three parts of linear tapping, piano style tapping and contrapuntal style. This lesson deals with tapping in a more pianistic style similar to Stu Hamm and Victor Wooten. Involves hammering with the tapping hand onto the strings without the need for an accompanying hand in the lower register. The exercises work to build the strength and control in both hands so that you can play one handed. The lines involve outling arpeggios, scales and block chords. Finally I split chords into a low bass note and chord tones in the upper register then create a moving bassline below them. This helps to move smoothly into the next lesson on contrapuntal tapping.